SHE works through private entities, governments and local NGOs to establish the sustainable distribution of solar ovens. SHE provides training of local instructors who in turn train others – the “cascade” effect. Base line surveys are conducted before and evaluations undertaken after distribution to measure success. SHE provides technical and, on occasion, financial support for these projects to insure their success. To measure the permanence of a distribution project an evaluation of the solar cooker is conducted. This evaluation includes site visits, record keeping on incidence of use and refresher training when needed. For a report on evaluations of previous projects click here. 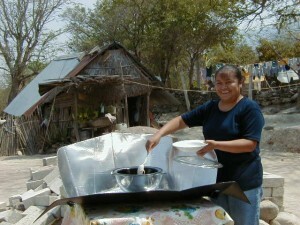 The story of Norma Lupe, in Oaxaca, Mexico, illustrates why the HotPot solar oven is a good investment. To cook food for her family of five, Norma Lupe alternates fuel. Sometimes she uses bottled gas at a cost of 80 cents per day, sometimes she uses fuel wood which she either buys or gathers herself. The choice between gas and wood presents a dilemma since gas is easier to use than wood, but more expensive—it consumes nearly 10 percent of Norma’s basic income. While wood is cheaper, it is more cumbersome to use, emits dense smoke and occasionally burns young children. In addition, foraging for fuel wood causes environmental damage. Furthermore, it is increasingly time-consuming as Norma must walk further and further to find it. In May, 2003, Norma participated in a free trial of the HotPot solar oven, and quickly became an enthusiastic student of solar cooking. By the second day, she cooked dinner for her entire family and proceeded to bake four cakes, all with her new HotPot. The HotPot opens a new era for low-income women like Norma. She will now be able to protect the health of her family, save money on fuel and enjoy freedom from cooking the old fashioned way. The natural way to cook! For US domestic orders only, click below. For international orders, please contact us.